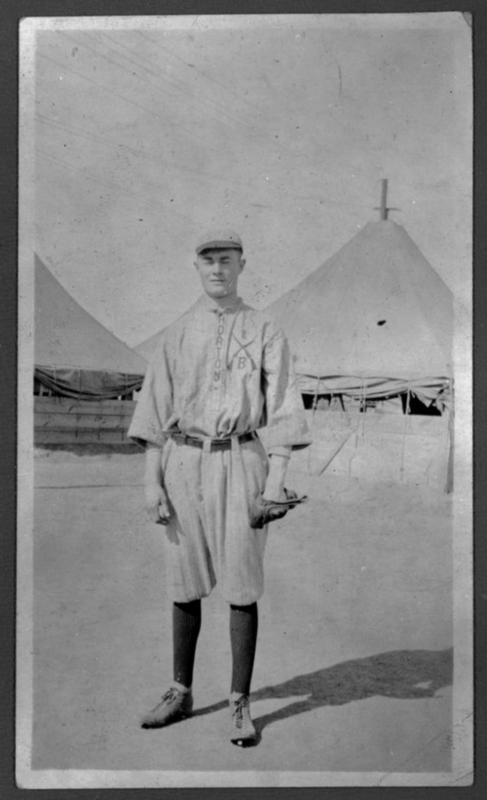 This is a photograph of Virgil Barnes, of Circleville, outfitted in Horton's Company B baseball uniform. The photograph is not marked but, likely, was taken in 1917, following the U.S. entry into World War I. Horton's Company B, of the First Kansas Regiment, mustered into national service in August 1917 and bivouacked in Horton before being sent to Oklahoma for training in early October. In the photo's background are army-style tents used to house soldiers. Barnes' jersey is clearly marked as belonging to the Horton Company B baseball team, and he presumably played for the team on the day the photo was made. However, Barnes was a member of Jackson County's Company B of the Second Kansas Regiment, based in Holton. Both the Horton and Holton units were sent to Camp Doniphan in Oklahoma for training, where they were consolidated into Company B, 137th Infantry Regiment, of the Army's 35th Division. The 137th Infantry deployed for France in April 1918, and took part in the epic Meuse-Argonne battle in late September 1918. Barnes was gassed during the battle, and was hospitalized for a time. After the war, Virgil Barnes pursued a professional baseball career. A right-handed pitcher, he played seven complete seasons at the major league level, primarily for the New York Giants. He had 61 major league wins, with a career ERA of 3.66. His best year was 1924, when he had an ERA of 3.06 and a record of 16-10. Barnes made World Series appearances in 1923 and 1924, including the starting assignment in Game 7 of the 1924 World Series. Virgil Barnes was born in Ontario, Kansas, in 1897, and was raised in the nearby town of Circleville. His older brother Jess also was a major league pitcher for several years. Two younger brothers, Charles and Clark, received tryouts with major league teams but did not make their rosters. This is a photograph of Virgil Barnes, of Circleville, outfitted in Horton's Company B baseball uniform. The photograph is not marked but, likely, was taken in 1917, following the U.S. entry into World War I. Horton's Company B, of the First Kansas Regiment, mustered into national service in August 1917 and bivouacked in Horton before being sent to Oklahoma for training in early October. In the photo's background are army-style tents used to house soldiers. Barnes' jersey is clearly marked as belonging to the Horton Company B baseball team, and he presumably played for the team on the day the photo was made. However, Barnes was a member of Jackson County's Company B of the Second Kansas Regiment, based in Holton. Both the Horton and Holton units were sent to Camp Doniphan in Oklahoma for training, where they were consolidated into Company B, 137th Infantry Regiment, of the Army's 35th Division. The 137th Infantry deployed for France in April 1918, and took part in the epic Meuse-Argonne battle in late September 1918. Barnes was gassed during the battle, and was hospitalized for a time. Virgil Barnes was born in Ontario, Kansas, in 1897, and was raised in the nearby town of Circleville. His older brother Jess also was a major league pitcher for several years. Two younger brothers, Charles and Clark, received tryouts with major league teams but did not make their rosters.